Black Metal band from Reinhardshagen (Germany) started in 1990 under the name Morpheus. They changed their name for Dark Implore in 1993 and for Wargod in 1994. Under this name they had released there first recording : a split-demo with the band Blasphemia in 1995. Later the same year, they chanced their name for Ancient Wargod and released a demo under this name : "In a Blackened Sky". 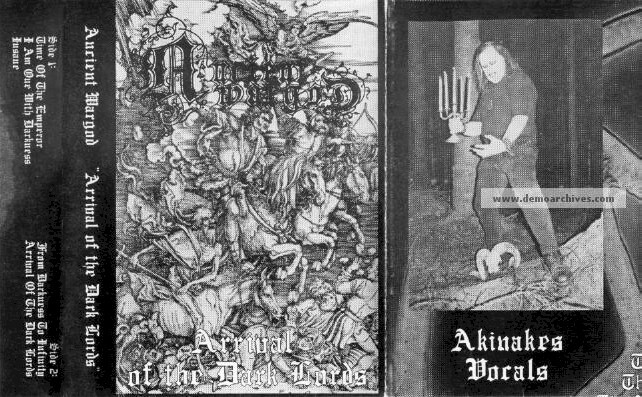 Two more demos was released in 1996 : "Arrival Of The Dark Lords" and a Rehearsal demo limited to 50 copies. The full-length "When Darkness Rises...." was released in 1997 by Brain Pain Records before the splitting of the band in 1998. Some members are also involved in the band Andras. Professionally printed cover with lyrics and band pictures. Black tape with a sticker both side.